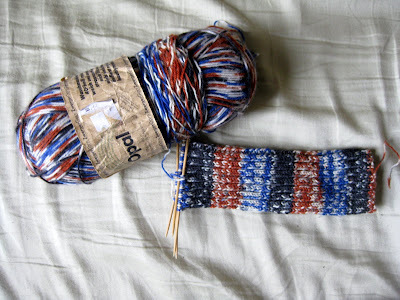 My second ongoing attempt at hand spinning with a drop spindle is coming along nicely. I’ve found that this prepared roving is much easier to spin than the wool I bought in fleece form and subsequently hand carded, and it helps that it is a higher quality wool. So far, it has been a very enjoyable experience. 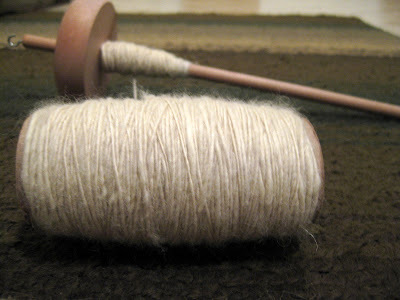 I even find myself dreaming of spinning at night, and getting intense cravings/urges to have the spindle and wool in my hands throughout the day. And the socks are fine, too. Taking a little longer than I planned. But bicycle riding and reading has filled a lot of spare time. The weather yesterday was delightful, even better today. In other news, the celebrations for St. Patrick's day were a blast. 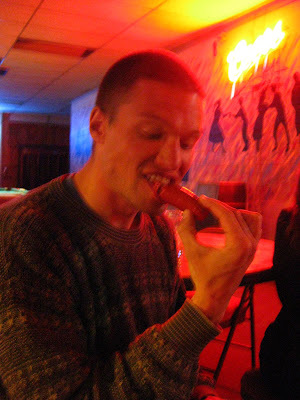 As usual for a Tuesday, we started off with burgers and big dogs (mugs of beer) at the White Owl in Logan. A good group of friends gathered together, including Justin who visited us by riding his bicycle up to Logan from Salt Lake City. His endeavors are inspiring, as are the hobbies, practices, and beliefs of most of my friends. 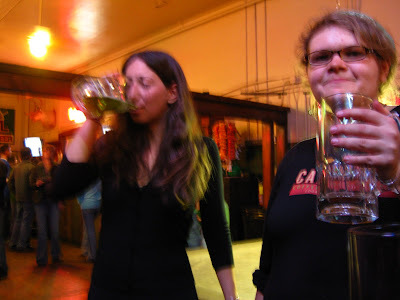 After having our fill of the crowded and rowdy bar that served green beer we decided to take our bikes over to Sultan's Tavern, another bar in Logan. Some people (including myself) might be deterred when walking into a bar and finding their own group of people and two other patrons are the sole customers. Some people (including myself) might think it would be better to go home and play games. Wrong! 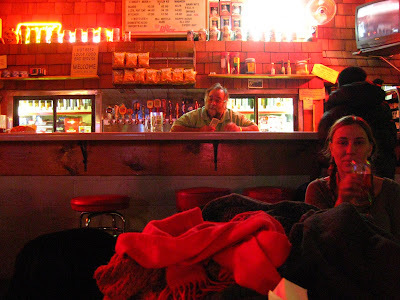 We loaded the jukebox with ridiculous songs, played some pool, Carson and I grooved the dance floor like nobody else could or would, and Ben gave us the experience of the night-- buying and sharing a Hot Mama sausage. I'm quite sure it was uncooked sausage made (in)edible by pickling in spicy vinegar for who-knows-how-long. Today I've been contemplating the benefit of single speed bikes, especially fixed gears. I can't imagine the stress of trying to get to campus without gearing down while pedaling up old main. you amaze me. spinning wool, spinning tales, spinning beats...or at least grooving to them. sounds like a fabulous time!